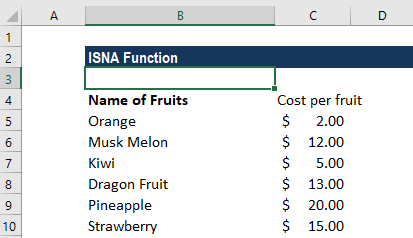 What is the ISNA Excel Function? The ISNA Excel function is categorized under Information functionsFunctionsList of the most important Excel functions for financial analysts. This cheat sheet covers 100s of functions that are critical to know as an Excel analyst. The function helps in checking if a cell contains the #N/A! error. It will return a FALSE value for other types of error. As a financial analystFinancial Analyst Job DescriptionSee a real Financial Analyst Job Description including all the skills, experience, and education required to be the successful candidate for the job. Perform financial forecasting, reporting, and operational metrics tracking, analyze financial data, create financial models, we deal with data and perform analysis on them. The ISNA function helps to identify cells that contain an #N/A error and facilitates smooth comparisons, data analysis, etc. We can use the ISNA function with the IF function and test a cell for error and display a customized message for it. The ISNA function will return TRUE if the value is an #N/A error and FALSE if it is not. #DIV/0! =ISNA(#DIV0!) FALSE Although the expression given was an error, it is not the #N/A error. The ISNA function returned FALSE. #N/A =ISNA(#N/A) TRUE The ISNA function returned TRUE, as it is an #N/A error. #NAME? =ISNA(#NAME?) FALSE Although the expression given was an error, it is not the #N/A error. The ISNA function returned FALSE. Text =ISNA(TEXT) FALSE The ISNA function doesn’t cover text so it returned FALSE. Suppose we wish to find out the cost of few fruits. When using the VLOOKUP formula, one of the irritating things is seeing the “#N/A” error after Excel determined a lookup value is not available. Rather than showing values when they are unavailable, from a visual design perspective, it’s better to just show a blank space or a Not found” message. It makes our output look more professional and polished. It also draws less attention to the error values and lets users focus on the values found. So, we want MS Excel to return a customized message “Not found” when it is unable to find a fruit from the given list instead of #N/A!. We need drag the formula for the entire list for which we need to find out the cost. Using the IF-ISNA formula combination is easy. All we need is to wrap the ISNA formula inside an IF logic condition. Remember, the crucial thing here while using the IF-ISNA formula combination is that we need to put in your original formula twice. The ISNA function is part of the IS functions that are often used to test the results of formulas in a cell for errors. If we are using MS Excel 2013-2016, the function is very useful for identifying and handling #N/A! errors.